You must be asking yourself what this fourteen year old ballerina has to do with martial arts, fighting, and history? In fact, I suspect that almost everyone who swings a sword or reenacts can stop reading. I suspect that everyone trained in any sport or physical art can look at this young woman, and guess what today’s blog is about, and what I’m going to say. By the way, this is Miss Hannah Lowe of Toronto. She is a passable Italian longswordswoman, and an effective arming sword fighter as well. And from her and some other young people I have the honour to train I have learned some dramatic and important–in in some cases, disheartening–lessons about history, and about fighting. Hannah has been dancing since she was three years old. By fourteen, she has reached a stunning level of proficiency; if you saw her dance the role of the Sugar Plum Fairy in the Nutcracker, you’d know that she’s nearly at the level of a professional. Hannah and Aurora Simmons with arming swords. Aurora’s turn comes next week. The results were disquieting, and changed the way I see the martial arts of the past and the qualities and training of pre-modern warriors. 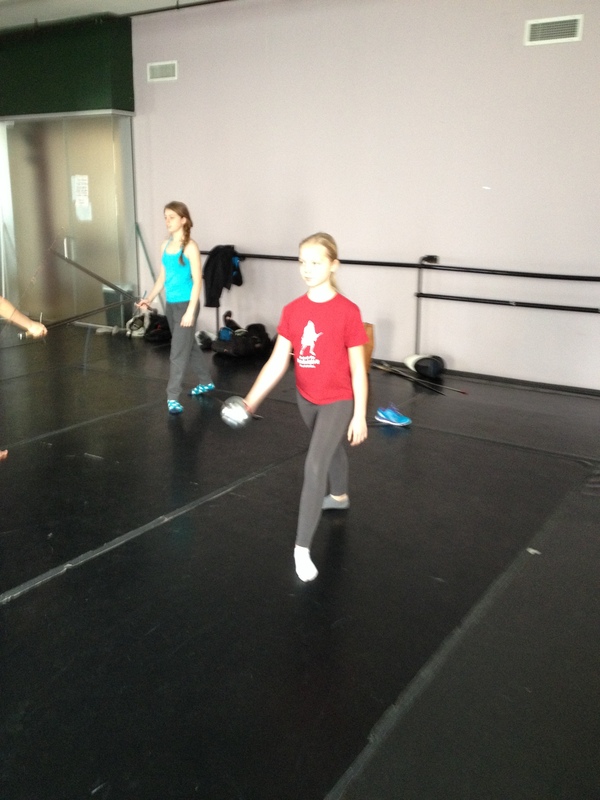 Hannah went through the entire 12 week basic children’s fencing corpus in an hour and a half. Some of you are nodding–others, perhaps, fencing teachers, assume I’m a dreadful instructor. But both Hannah and my own daughter,(an eleven-year old fencer who has been dancing since age three) do not need to repeat body postures more than twice. If they are shown a drill, they learn it. They don’t discuss, they do not posture about their own knowledge (displaying a lack thereof). They do not complain. Most of all, however, they exactly mirror what they see. So, for example, Hannah mastered the long lunge the first time she did it. There was no casting about for balance at the end of her reach, and no fumbling recovery. The amusing corollary to this is that if you, the teacher, have a bad habit, you can assure yourself that it will be instantly transmitted. This is stunning. 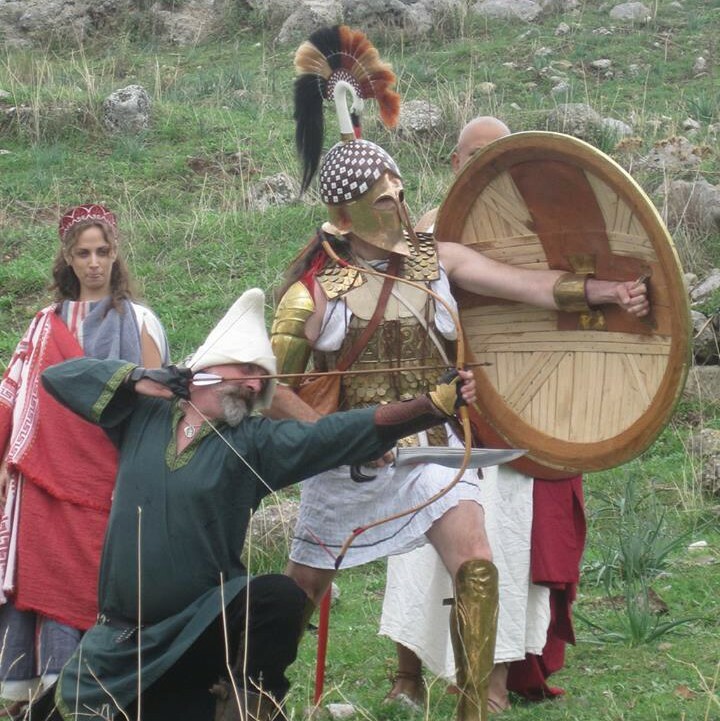 The speed with which children take to the art of arms suggests to me that no modern adult athlete taking up Armizare–or Pankration or Bolognese or Kenjutusu–can possibly match the art of learning, the bodily discipline, or the enthusiasm for practice of a twelve-year-old. It explains a number of things that had made me wonder in the Medieval manuals… in Fiore, I often look at the complexity of the plays and wonder how often a swordsman encountered an opponent as well trained–and how often, for example, he even remembered under pressure how to counter a punta falsa. 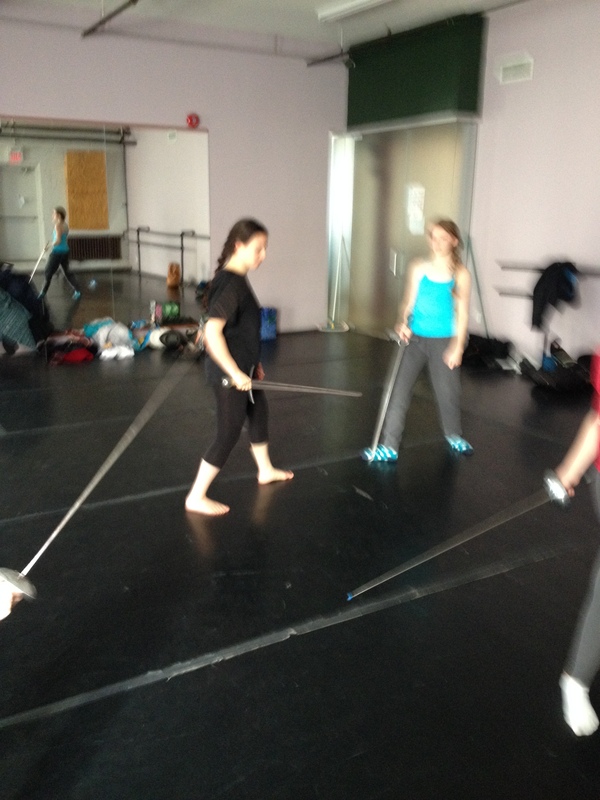 But Hannah and my other dance children suggest to me that they would, in fact, remember their sword lessons, for ever. I recently had an opportunity to train one child four days in a row. I structured our first lesson so that he would get a review of things he’d seen with my friend Greg Mele in February. Apparently I was the one who needed review– he remembered everything, down to foot placement and even what errors he’d made in class. Ah… but if they all began training at age eleven of twelve, I think I can see it differently. And the other thing that emerges is how very much better the children of aristocrats must have been at war then the children of peasants–because training matters. Training is not just good for itself, but for self-discipline and confidence. Both excellent virtues, in battle. And this leads me to the part that writers about these people probably need to grapple with. Because ultimately, it is about character. And youth and training form character. Young people who practice their arts for fifteen hours a week are going to have different motivations and different ideas about pain, endurance, pleasure, fitness, and even morality. They will make decisions that would be very different from the decisions of untrained people. Antonio Cornazzano, a sometime mercenary man-at-arms and the author of one of the earliest books on dancing, suggests that a his well-trained princess should be able to read Latin, to deliver oratory extempore in that language, and to dance a long dance of her own composing to music of her own composing and accompanied by her own singing. That would be your thirteen year old princess, and it suggests that being a princess could be pretty hard work. Or… just… practice. Some students, trying a Bolognese posture… well, a modern ballet posture, too, it turns out. And really, for all you aspiring knights, swordspeople, and martial artists… and baseball players and dancers… it is really all about practice. Practice at home. Practice while you walk. Make practice an essential part of your life, and you will be a vastly better practitioner than if you merely go to class once or twice a week. Class isn’t where you learn. Class is where you learn what to practice the rest of the time. You think practice is boring? I practice 10 3/4 hours a week. I’m going to estimate I spend 7 hours a week thinking about dance. (That sounds crazy!) Occasionally I find practice boring, but there are always an infinity of things that can be improved and tweaked, and perfected, so it takes a lot to make something actually boring. My favourite form of practice is probably how I do it with my private coach. We’ll take a variation that I’m learning and just work on every little detail for an hour straight, or we’ll start with a small exercise and build it up and keep working on it until it’s practically an entire piece. This way of learning is great for everything, technique, presentation, stamina, conditioning…. If you note, my characters all train. 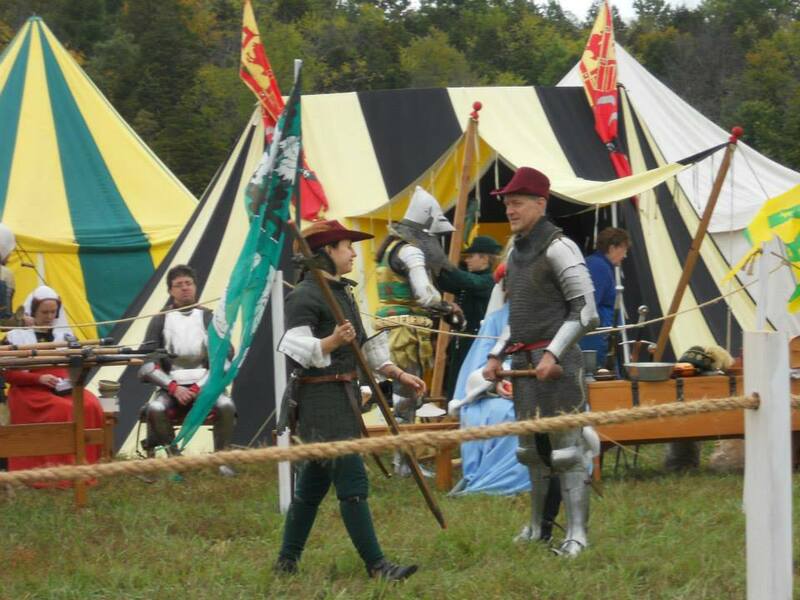 Tom Swan visits swordsmen in every town he travels to…sometimes so I can name drop, but also because I want the reader to see that good swordsmanship, jousting skills, horsemanship–people in the past worked on these every day. Oh, and a small note: I own a copy of Antonio Cornazzano’s book on war, and my historical reenactment ‘Not-For-Profit’ (called Hoplologia) intends to pay to have it professionally translated and then we’ll make it available as a PDF free on the internet. We’ll be cloud funding and looking for donations in a few weeks. Hope you are interested. There’s good stuff in Cornazzano. And we want to make history live, don’t we? It rather highlights, again, that how much of what we consider to be the “way” that things should be done now are flawed and that the practical and necessary ways of the past had discovered what worked. I have also noted as a teacher/practitioner, I started the use of weapons properly around 9, though dad had made weapons from as soon as I could walk, archery from age two, that how many of the methods of teaching we have now, are far more about how people/adults think on what is important to teach, rather than what is important for the child/beginner to actually learn. Also that learn is about self discovery so that one is not a teacher, but a guide. Dill, I’m a very slow physical learner…I need to repeat things over and over. Oddly, this gave me my excellent practice habits… I too envy the athletically gifted. ll and someone whose day job is teaching people to move themselves and weapons, we have had a number of students with dyspraxic, a number of thee have been some fo the best movers we have taught. As to falling over ones feet, we all do that, the question is what one does once it happens and how ones views yourself because of it, no one is born with good muscle memory, but we can affect how our nervous system develops movements by how we think or rather how we have been taught to think, by ourselves and others, about our ability and potential. in the middle ages aristocratic boys became pages at age 7, and i bet their parents tried to place them with a lord that had a good master of arms to train them. Don, I agree, although there were, I suspect, as many factors to being sent as a page as there were to marrying off your daughters… family influence, money, distance, alliances… As a martial artist, I confess I’m very eager to see any evidence about the men who taught in the castles. SO far, there is very little. The kind of training that became available in the late 14th c. may just not have existed before that–it may be of a piece with the rest of renaissance education. SO much to learn. I think the training was there. The rise of our knowledge is based upon the “written” works about it. The rise of these works come from various aspects. The notion of written work as an end of itself and the idea that the written work can be used to preserve knowledge and the allow those that don’t have direct access to the skill. So in much the way that the crafts and skills were passed on directly, master to apprentice, the similar pattern was there in the arts martial. Though I also think that the martial skills can be over emphasised to the so called “fighting classes”, other aspect become more important in the life of those that fall in that class, unless they make arms their full time profession. I think it was there too, but as a research oriented person, I’d love to see — well, anything from the 11th or 12th centuries suggesting practice of what we’d call training… however, I suspect it was all ‘lifestyle’ training, really. The quintain and the pell. I had never really given any thought to the fact that ‘character’ could come down to the someone practicing an art form up to 15 hours a day and having the gifted life that allowed that. It makes sense, and yet as both a reader and a writer, I want characters to possess attitude, fitness and morality (or lack thereof) because of other things as well – family guidance, the Church (I read and write medieval fiction), pressure of daily work and survival against the odds. I do love your posts, Christian. You always make my grey matter work that much harder. Prue, you are “never” too old, I have taught people of all ags to shoot and use weapons. However as Christian points out, the younger you catch someone it normally makes it easier, Mainly in my experience because they have had less time to acquire and listen to the doubting voices that complicate and tell us that we can’t do something, those being the things that are the biggest inhibitors to acquiring new skills. but drive is a very important factor to strive for excellence. As an archer.I will readily concede to the importance of dancing to swordsplay. However.. archers don´t dance. But the driven amongst us also THINK about how they´re going to hit their targets. And the more we think, the more we hit. We see those arrows flying in our minds everywhere. It has only been in recent years that our culture has stopped being one that danced. Historically speaking cultures danced. So while dancing may not seem to have a direct relevance to an archer, it was certainly a physical factor in the culture that produced, for example, the medieval English archer. Increasing body awareness and and control, can’t be a bad thing for any physical skill. we seem to be agreeing quite well here and on FB! You’re talking about 12 year olds learning quickly – but if they started learning kinesthetic skills at three then it took them nine years to get skilled enough to get to the point of picking things up quickly. What I saw reading this wasn’t so much a lesson about age specifically so much as about it taking a decade of diligent training to get to that point.